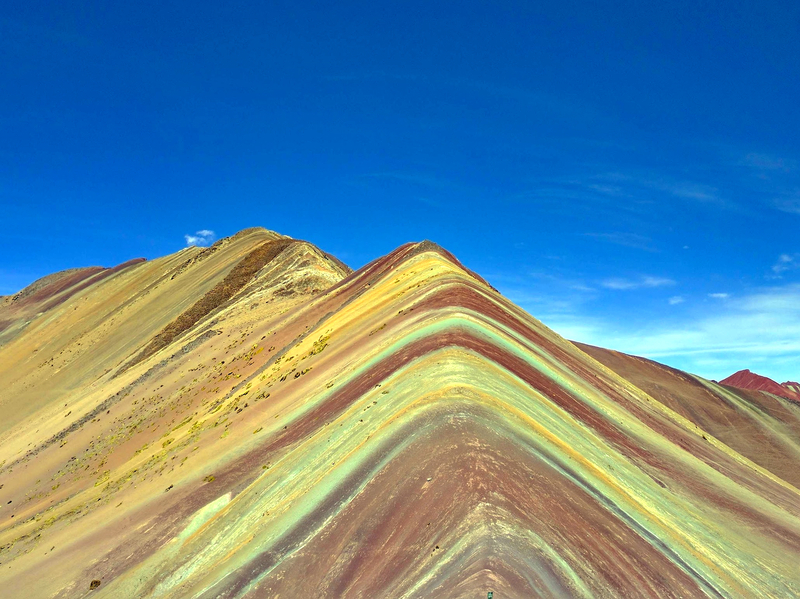 Ausangate Mountain, an “Apu” (or holy mountain) in the Quechua culture, rises to 20,945 feet in the Peruvian Andes, hovering nearly 3,885 feet above Rainbow Mountain in the distance. For perspective, that’s 3,345 feet higher than the Mt. Everest base camp, 6,456 feet higher than the tallest mountain in the Continental United States, and nearly 15,665 feet higher than the “mile high city,” Denver, Colorado. After a punishing two-hour trek straight up, sitting at the peak of Montana de Colores (Rainbow Mountain) next to a small stone wall built by the direct descendants of the Incan people, I popped open my first beer and spun in a dizzying swirl of colors. Ausangate rose in the distance like a giant, its glacier so massive that I mistook it for sky. Standing below it, I now understood why the Quechua people called this mountain a diety. 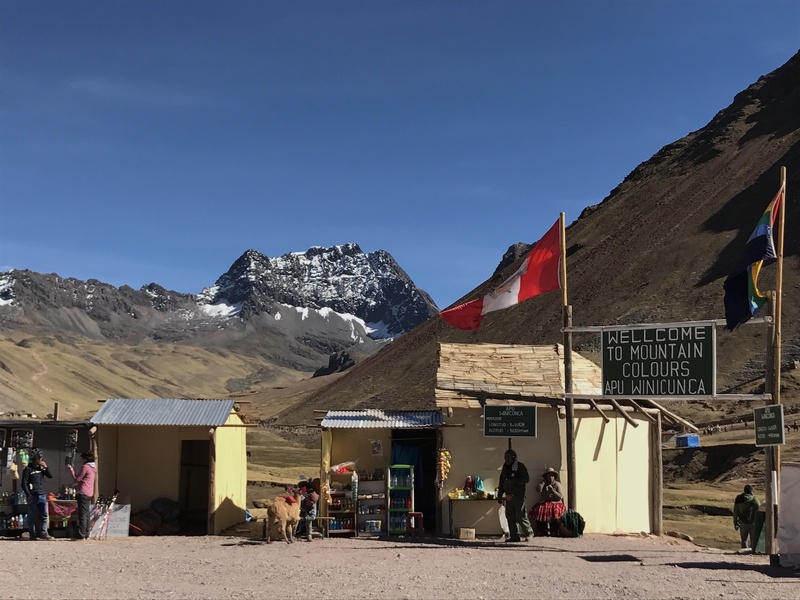 I felt like a pilgrim, my body bruised, battered and broken, surviving the hike up Rainbow Mountain — like the Quechua do once a year — to stand at the face of the wise Ausangate, who is believed to hold the answer to any question. “Three hours,” the tour agent had said, with no mention of what was to come. Jess and I sat on the other side of the desk, excited to see Rainbow Mountain but wary of a three-hour bus ride beginning at 3 A.M. the next morning. We had been traveling so much already, and we were not eager to feel like herded cattle again, jumping from bus to bus with strangers and having no idea if we were actually headed in the right direction. She went on to tell us that lunch was included and they would pick us up from our hotel, but the extent of her English faded when our questions began. Still, we agreed, because the picture of Rainbow Mountain on the flyer looked too good to pass up. “Three hours,” she said again as if to reassure us that we were doing the right thing. There was no mention of one of the most dangerous roads in the world and our madman for a driver. There was no mention of marching through native people’s land without permission. And there was no mention of the breakfast of mystery meat and Tang that was supposed to fuel us for a strenuous day of bus rides and hiking. If I would have known about the ill preparation and altitude sickness that would wait for us at the top of Rainbow Mountain, I don’t know if any photoshopped picture would have been enough to convince me to go. Although, in the end, I’m glad that I did. The bus’s horn shook the gravel of the steep road. We had been speeding over cliffs, atop mountains and through deadly valleys carved by the rushing current of melted snow for an hour. The llama that often blocked our path gracefully charged out of the way of our madman driver as he threw us around turns with almost no regard for speed, sharing with us a sure image of our imminent bus crash. I was silent, holding on to whatever control I had in silence, but others dealt with the terror of the road with laughter and jokes. We were all trying to pretend that our lives were not in danger, and we were all trying to hope that the ride would soon be over. Bus after bus after bus moved through the villages in the valley like ants swarming a live beetle, honking their horns, telling the Quechuan people that they would not slow down — to get the hell out of the way. 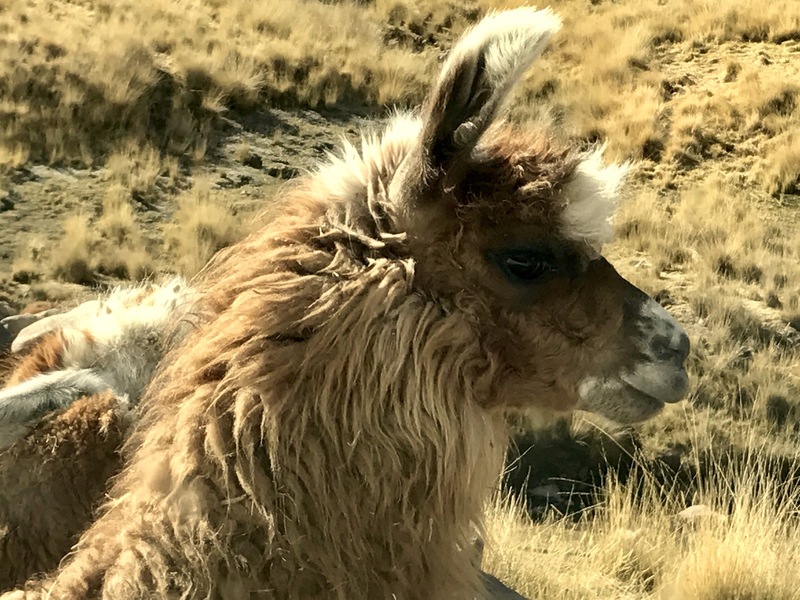 Sun-hardened faces peered up at us from fields filled with llama and sheep and crops still frozen by morning irrigation. We did not belong here, the faces said. Children stared at us from fields or from the back of motorcycles that their elders drove, maybe wondering where we had come from. Of course, it wasn’t the first time that the indigenous people had seen a parade of buses move through their land like this. This road was built a couple of years before to shuttle tourists to the Quechuan scared site of Rainbow Mountain, and like everything else in Peru, sacred sites were big business: packaged, labeled and sold to the adventurous, first-world traveler, just like me. And judging from the number of buses that barreled through the villages, kicking up dust clouds that fell and covered the clay, hand-made structures of the Quechuan, business was booming. “Three hours,” the tour agent had said the day before, but they were three hours that would turn into six. Two lanes that would turn into one. Hills that would turn into towering monstrosities of beauty. And ditches that would turn into chasms, showing us marveling views of our own possible death. They were the words that I could not forget as I stumbled out of the van onto solid ground and stood at the trailhead before the Apu, the holy mountain. Ausangate’s glacier scraped the sky and combined the line of earth and heaven. Its melting snow formed rivers that had cut the earth in half and created the life-filled valleys that the people we passed now called home. It was no wonder to me that this holy mountain was a diety. It was no wonder to me that the people supposed that it could answer every question in life. It was no wonder to me that once a year the Quechua came from all over the region to search for answers and healing and life in this great Apu’s shadow. The white of its peak was so untouched, so massive, that I double took. I had mistaken it for heaven. The guide had said with broken English. We had two hours to reach the top. Just two hours for a four-mile hike with a 5,000-foot elevation gain. Two hours of internal battle, broken spirits and escaped breath. It’s right around the corner, I told myself. But as I watched the mass of bodies move up the incline to where I thought the peak to lie, my heart dropped and my body shattered when the peak that I knew to be the top opened into a tundra wasteland. To a distance that looked too far away to be real. Each step brought us closer, but each step also brought us higher, toward thinning air. I took my coat off, hoping that the fresh air and the lack of a heavy coat would help me breathe, but cold wind from the surrounding glaciers froze cold sweat to warm skin. My head was spinning from lack of oxygen and my fortitude was slowly leaking through the souls of my boots. A Quechua man yelled at me. They waited for my answer but ran past me when I didn’t speak. Some were wearing sandals. All were wearing short sleeves and did not seem to feel the cold or the lack of oxygen or the steep incline. My eyes fell to my feet, hating the fact that I did not feel prepared. I was not used to the elevation, and I could no longer enjoy the beauty of the mountains with my head feeling like a balloon. With each step, my legs screamed and my lungs wanted for more . . .
“No, Gracias,” I said in my head, but the words would not come out. I could no longer afford to talk. The hike was becoming a lesson in suffocation. “Caballo?” came a voice, then another, but I heard nothing. Only my own voice spoke quietly, telling me to put one foot in front of the other, to not look ahead. To just keep breathing. To take a break when you need it (which ended up being about every 20 steps). This is only a small part of your life, I told myself, and I was right. The end was in sight. When I finally looked up, when my eyes followed the line of bodies who were making the same journey as me, I knew that we were about to reach the top. Steps rose before us, and we took them each with a painful gait, stopping every few to convince our legs to continue forward without air. We were out of water. My legs felt broken. But there was light in the distance. I saw a man selling beer at the top, and I felt a motivation to reach it as I’ve never felt before. Rainbow Mountain sits roughly the same altitude as the Mt. Everest base camp. As I sat at the top of the mountain, cowering beside a small, stone wall that blocked the wind, my eyes beheld a sight that washed away the pain of the journey. Red, yellow, green and blue combined on a ridge in stripes, each running into each other, each standing out from the other. The colors aligned in a sedimentary pattern that the wind had revealed over the ages, but it wasn’t just the colors that made the sight one to behold. The Apu hung powerfully from the sky as if he had defined these colors. This place seemed to exist to grind a person to nothing. To make doubt of completion one’s singular thought. To crush one’s spirit so that they would be ready for the truth. I sat at the top of the mountain with the woman I loved, gazing at the legend of an Apu who had the answer to any question I dared to ask. We had done the hardest thing that I had done in recent memory, and we had made it. To ask a question seemed needless now. Nathan Standridge is a traveling writer based out of Asheville, NC. He’s been seen trekking through San Franciscan streets at 4 A.M., drinking whiskey during a tornado in the Ozarks, and existing in silence among the temples of Chiang Mai. Follow his adventures through Thailand, Peru, and Italy at Foundinpursuit.com, or check out his book Change, available on Amazon.